Sometimes life feels easy. And sometimes it feels hard. Lately, things have been feeling pretty rough and tumble for David. So I thought I'd cheer myself up by posting a picture taken in a moment of pure, blissed out happiness. A stranger took this shot of me. 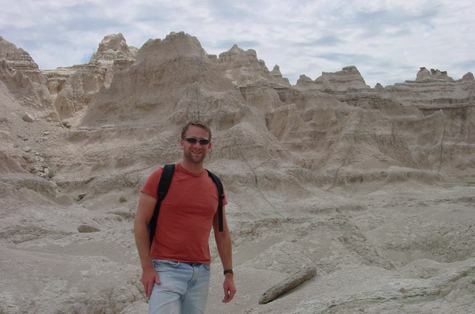 I was on a solo camping trip at the time, and the year is 2002. I think it's pretty clear how happy I am in this moment, but who wouldn't be with that gorgeous view in the background? Simply remembering this moment is making me feel better already. I hope you're feeling good too. Oh, and don't forget to answer this question by clicking on "Comments" below: Where The Hell Am I? Feb 29, 2008 12:01:00 AM | Where Am I? In the event that you do not represent one of the 6,434,729 people who have already viewed this fabulous YouTube video, enjoy. I wish I'd been there! Black Watch is the most riveting piece of theater I have seen in years. Up there with Angels in America and Metamorphosis. In the most theatrically creative ways, it tells the tale of a storied Scottish Army troop that served in Iraq. It is a powerful condemnation of this war, but also a stirring celebration of the bonds that underlie the willingness of young men to risk their lives at war. Black Watch played a brief, sold-out run at the amazing St. Ann's Warehouse, last fall. St. Ann's just announced that the show will return for 8 weeks, next fall, and tickets went on sale this week. If you care about theater, this is a show you cannot miss. Plan ahead and book it, now. Is he really going to do this again? 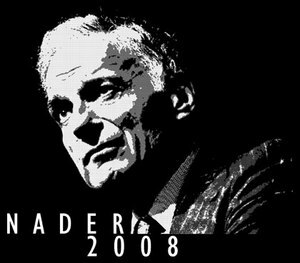 Have we not paid dearly enough for his last go-round? A couple of weeks ago the New York Times Travel section ran a terrific piece on traveling to Iran as a tourist in 2008. 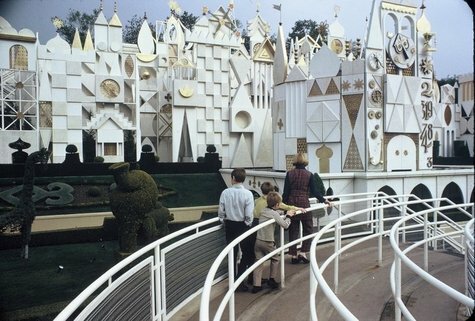 It made me want to visit more than ever. Alas, many things make this trip seem unlikely for me in the near term. Instead, I went to the movies! I saw a film called Persepolis, which happens to be nominated for Best Animated Feature in this year's Oscar race. It gets my vote, hands down over Ratatouille. Persepolis tells the story of a precocious young girl's coming of age in Iran during its recent decades of religious upheaval and oppression. The film is heartbreaking and uplifting at the same time. Its political viewpoint is balanced, and none of the participants in the region (including Iraq and the U.S.) come off well. Persepolis is all the more amazing because the animation manages to conveys a tremendous range of emotion and experience despite being rendered in thick, flat lines of black and white. Persepolis takes you on a wonderful journey. I encourage you to buy a ticket and go. There are many reasons that people don't like Florida. Its statewide political machine makes most of us want to heave. You know, the board of elections that handed Bush the presidency and screwed its citizens out of a chance to be heard in the 2008 primary. There are also many reasons that people don't like Hillary Clinton. Her calculated, do-whatever-it-takes brand of politics is her one trait that I cannot stand, despite the fact that I am totally aligned with her politically. The following quote, originally from an article in the Huffington Post, illustrates my point, and has me burning mad about Hillary. This is why I find myself shifting from a Barack supporter to a Hillary enemy, and a case-in-point about why she cannot become the Democratic nominee. "Disingenuous," defined. In recognition of her nearly insurmountable climb back to the lead, Hillary is arguing that the Florida and Michigan delegations should be seated, a move that is so calculating and disingenuous, that it can be objectively described as an attempt to steal the election. In this shot, I am leading the pack of brothers because I cannot wait (!!!!) to get inside the funky building ahead. The year is 1969 (or thereabouts) and we are somewhere in the US of A, even though you might think this exotic looking structure is in Lichtenstein or Bilbao or some other fairy tale land. My adorable little brother Richard (well, adorable back in '69) was about 6 years old on this day. He's the one who's leaning on the rail ... and today happens to be his birthday. Richard plans to take his adorable son Jeremy to this very building come summer. I'll be there too. But the question remains: Where am I? Feb 19, 2008 12:01:00 AM | Where Am I? Our current president is one of the glaring human disasters of modern times. Our Presidential situation will change for the better this November, if we can get it together as a country and elect one of the two current Democratic candidates. Once upon a time, said office was filled with great Americans, two of whom – Washington and Lincoln – led to the creation of this weekend's holiday. 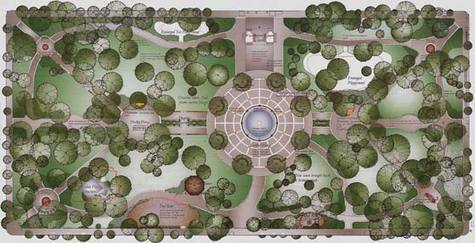 In Washington's honor, I hereby provide a link to the restoration plans of Washington Square Park. This oasis in the heart of Greenwich Village has felt tattered and battered for years, while every park around it has been gloriously restored. Fret not, because WSP is being spruced up as we speak. Here are the details. If this posts title had you hoping for a salacious tale from my Valentine's Day, sorry to disappoint. 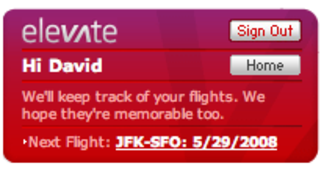 But here's the Virgin-popping story I want to tell: On valentine's Day I booked my first reservation on Virgin America!!! Now that is pretty damn exciting. A new airline. Totally high-tech. Mood lighting. USB and 110 volt plugs for every seat. Drinks and food ordered from your seat back. Satellite TV. Live seat-to-seat gaming. It's gonna be nirvana at 35,000 feet. I'll be flying TO San Francisco and returning FROM Los Angeles. Why two different cities? Because in between, I'll be riding my bike 545 miles, for the AIDS Lifecycle. You can sponsor my ride here. Thanks. Dubious about Dubai? Don't Be. I have been working on a project for Emirates, the airline of the UAE. Emirates has its worldwide hub in Dubai. I haven't been to Dubai (yet), but I am hoping this project gets me there (soon). 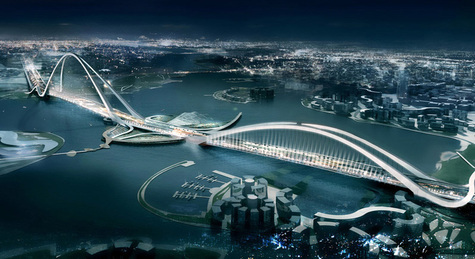 In the meantime, I had to share this image of a bridge about to be built in Dubai. It's called the Dubai Creek 6th Bridge. Thank you Gizmodo for the tip-off. This will be the tallest spanning arch bridge in the world, at 673 feet high. Heck, I didn't even know there was such a thing as a spanning arch bridge. I am, however, very familiar with Arches, having grown up in St. Louis, MO, which is home to the Gateway Arch. And I currently live in the hometown of the wildly creative architecture firm that designed the Dubai Creek 6th Bridge, called Fxfowle. Construction begins next month.